Pottermania returns to Grand Rapids. Last season, when the Grand Rapids Pops brought the Harry Potter Film Concert series to town, the Grand Rapids Symphony sold out three performances in DeVos Performance Hall. Find out what all the fuss is about this weekend when the Grand Rapids Symphony presents Harry Potter and the Chamber of Secrets on Friday and Saturday, September 29-30. Cars fly, trees fight back, and monsters are on the loose in Harry’s second year at Hogwarts School of Witchcraft and Wizardry. Relive the magical adventure of Harry Potter’s second year at school all over again. Experience the wonder of talking spiders, scolding letters, and giant snakes as never before. The Harry Potter Film Concert Series, created by CineConcert in conjunction with Warner Bros. and the Wizarding World of J.K. Rowling, presents the original film in high-definition on a 40-foot screen while John Williams’ unforgettable musical score is played live. Last season’s debut drew more than 7,000 to the Grand Rapids Pops’ performance of Harry Potter and the Sorcerer’s Stone in January. 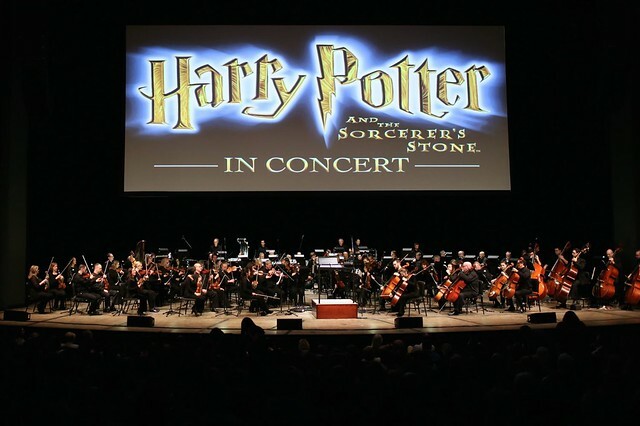 CineConcerts founder and conductor Justin Freer, who has appeared previously in DeVos Hall with the Grand Rapids Symphony, said all eight Harry Potter films eventually will be presented together with live musical performances. Guest conductor Nicholas Buc, who was in DeVos Performance Hall for the debut of the Harry Potter Film Concert Series last season, returns for the second installment in the series. Join Harry, Ron and Hermione as they encounter harrowing pixies, giant snakes and a mysterious diary in this concert event. Immerse yourself in the magic as you watch a house elf make trouble, giant talking spider, a mysterious diary and much more set to the music you know and love. The lobby of DeVos Performance Hall will be decorated in trappings of Hogwarts School of Witchcraft and Wizardry. Guests can take photos with a Sorting Hat or sample Butterbeer, which will be sold in alcoholic and non-alcoholic versions. Free wands will be handed out to the first 400 at each show. Members of the Grand Valley State University Quidditch Team will meet and greet Harry Potter fans. It since has become a worldwide phenomenon. One week from now, Harry Potter and the Chamber of Secrets will be screened in the Sydney Opera House in Australia. The following week, the second installment in the Harry Potter Concert Series will be presented in Toronto, San Antonio, Boise and Jacksonville. Later in October, audiences will be enjoying live performances in Innsbruck, Austria; Barcelona, Spain; and in Moscow and St. Petersburg, Russia. Fans of Harry Potter and the Grand Rapids Symphony last January said they couldn’t wait for the next installment.